Movement of transportation fuels (motor gasoline, distillates, and jet fuel) between the U.S. Gulf Coast and East Coast regions represents the largest movement of such products in the United States. This relationship is underpinned by supply and demand imbalances in each region. The Gulf Coast is the largest petroleum refining region in the country, making nearly half of total U.S. refined products. The densely populated East Coast is the largest consuming region in the country, accounting for more than one-third of total U.S. consumption of transportation fuels. EIA recently commissioned a study of transportation fuels supply, consumption, and distribution for each of the five large regions of the country, as defined by Petroleum Administration for Defense Districts (PADDs). The most recent study involves PADDs 1 and 3. PADD 1 is the East Coast, made up of 17 states and the District of Columbia, most of which have coastlines on the Atlantic Ocean. 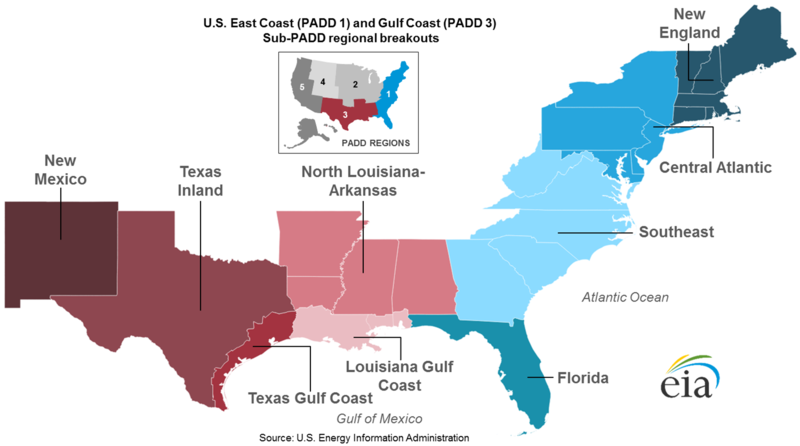 PADD 3 is the Gulf Coast, made up of four states with coastlines on the U.S. Gulf of Mexico, as well as Arkansas and New Mexico. The study examined market dynamics within nine sub-PADD regions: four in the East Coast and five in the Gulf Coast. Note: PADDs are Petroleum Administration for Defense Districts. Sub-PADD regional breakouts were used in the analysis. The heavy concentration of refinery production in the Gulf Coast, and the East Coast's dependence on that production and on supply pipelines from the Gulf Coast, are simultaneously a strength and a weakness. The concentration of refining capacity in the Gulf Coast (7.5 million barrels per day in 2014), and the connection of most of that capacity to two major pipeline systems (Colonial and Plantation), means that the unplanned loss of any one refinery—or even several refineries—can typically be compensated for by increasing production at other refineries in the region, or by drawing on the region's abundant inventories of transportation fuels. Also, transportation fuel exports from the Gulf Coast are high, approximately 1.5 million b/d in 2014, meaning the region's refineries have a significant export buffer, allowing them to shift production away from exports to make up for shortages in domestic markets. However, the concentration of refinery production in the Gulf Coast also presents a vulnerability to supply security in both PADDs. Designed to take advantage of the region's deepwater ports, Gulf Coast refineries and associated infrastructure are heavily concentrated in coastal areas, making them particularly vulnerable to disruption from hurricanes and other tropical weather patterns that threaten the Gulf Coast. Not only can these weather events cause widespread damage to both crude oil and refined product infrastructure, they can also disrupt essential power supply, potentially rendering refineries, terminals, and pipeline pumping stations inoperable. Several major hurricanes have disrupted the Gulf Coast's transportation fuels production and distribution infrastructure in recent years, including Hurricanes Katrina and Rita in 2005, and Ike and Gustav in 2008. More information on East Coast and Gulf Coast transportation fuels markets is available in PADDs 1 and 3 Transportation Fuels Markets Study. An earlier study evaluated transportation fuel markets in the Pacific Coast region (PADD 5).